This ATDF Journal discusses embeddedness and assessing the quality and extent of «local embeddedness» as a sustainability indicator that captures the positive externalities generated by multinational companies for the local economy the local environment, and the local community and its transformation. The term ‘embeddedness’ has been shaped and re-shaped by the research of economic sociologists in the 20th century. Karl Polanyi initiated the academic debate on embeddedness with the publication of ‘The Great Transformation’ in 1944. His basic argument was that the institutions of embedded traditional economies are being destroyed by a self-regulating market economy in which the market no more serves the needs of the people but rather reversed, that people would have to meet the needs of the market. As a consequence, the expansion of the formal market economy would lead to the disembedding of local economies with ‘catastrophic consequences’ for local communities. 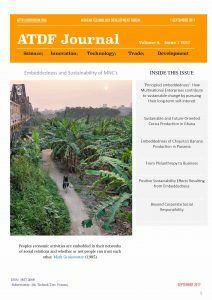 Download the full PDF version of the ATDF Journal Version 9, Issue 1, 2017 on the Sustainability effects from embeddedness of multinational enterprises (MNEs) in developing countries.